"Most of the time, it only takes a couple of levels to crush your enemies. Sure, you might be throwing grapes at elephants for how little damage you do, but you'll never get hurt – even head-on – as long as you constantly press forward. Eventually you'll be able to annihilate them with just a few choice blows." When I picked up Ys for the first time on the Nintendo, I knew I was playing an inferior version. I'd been told many a time of how the Turbo CD did it better – from music, to graphics to smoother mechanics. But, I didn't care. The NES port was the best I could do at the time. Yet, despite all that, I still enjoyed the game immensely. Its unique style of combat combined with its own set of challenges really set it apart from other action-RPGs of the era. In fact, I loved it so much that I couldn't wait to play the second, thinking the experience would be just as fantastic as the first. Needless to say, I came away from it somewhat disappointed. Ys II picks up right where the first left off. Adol wakes up in Lance Village shortly after arriving in the magical land itself. The townsfolk don't really tell him much other than that they've seen a great number of demons prowling the ruins outside. Later you learn about the missing elder, a sickly child, some missing iron ore, and, most importantly, the six priest statues that will guide you to the source of evil plaguing the land. To receive their aid, Adol must return each of the six books collected on his previous adventure to the priests' hallowed chambers. This stretch of the story will take him through dilapidated ruins, monster-choked caverns and a demon-infested sanctuary. And through it all, I felt as though something were missing. Something more than just the expected weaknesses that the NES port brought with it. 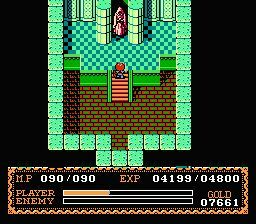 I could deal with the fact that Adol moves too quickly to make running through a dungeon full of tough enemies practical. Plowing through unknown territory without any hesitation could lead to painful head-on collisions, and attacking without pause could leave you hurting if Adol steps half a pixel too far in any direction due to unreasonably high speed. But these were mostly early game issues that I adapted to quickly. Then I realized what it was. 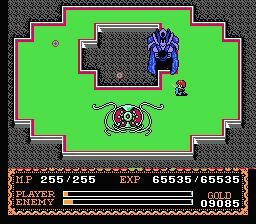 While fighting the second boss, I was met with such an underwhelming level of challenge that I found myself scratching my head and wondering if this shouldn't have been a separate game entirely after all. 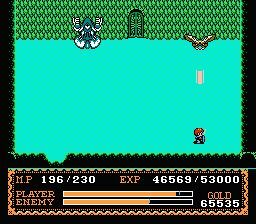 Those who played the first Ys know that its greatest draw was its high-octane boss fights. Nearly all of them featured a key weakness unique to each confrontation. Furthermore, each enemy had rapid, highly unavoidable patterns of attack that made striking and dodging nearly impossible. However, Ys II took nearly all of that away from me. Instead of fighting the infamous Dragon Worm, which could only be struck in the tail and moved nearly as quickly as you, I fought a giant bat, which fluttered around predictably and spat three fireballs that spread out like a shotgun. I killed it with fire magic. 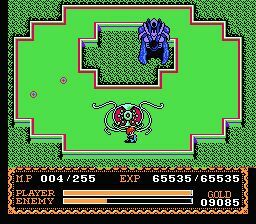 Rather than fight the Great Mantis, which sliced me to ribbons every second and required all of my reflexes just to vanquish, I fought Dolga, a demonic falconer whose pet puffed fireballs. I killed him with fire magic. In fact, I killed nearly every boss with fire magic, except the last two, though the first of these was still obnoxiously easy. What made it worse was the fact that I could leave the fight any time I wanted to go heal at one of the six priest statues I'd found earlier. Seriously. I could just leave through that doorway at the bottom of the screen. Sure, I'd have to fight the boss at full strength again, but it's better than dying! The first Ys never afforded me such an opportunity. 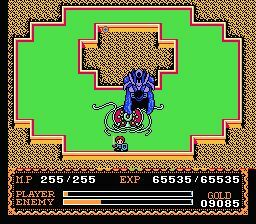 Even regular dungeon crawling isn't as challenging for much the same reason. Most of the time, it only takes a couple of levels to crush your enemies. Sure, you might be throwing grapes at elephants for how little damage you do, but you'll never get hurt – even head-on – as long as you constantly press forward. Eventually you'll be able to annihilate them with just a few choice blows. In the rare circumstance you are under-leveled, all it takes is an hour or less of grinding and you'll be fine. And if worse comes to worse, you can just magic yourself to the nearest priest statue and have your health and mana restored instantly. The travel back might be annoying if you haven't discovered any nearby villages to Return to, but at that point, you'll likely have leveled enough on your way over for it to be a breeze. Ultimately, this game's greatest flaw is its own innovation. That is, the magic system. Whereas Ys I made you equip a variety of rings that did things like regenerate health in dungeons, or boost attack or defense in battle, Ys II grants you a large variety of magic, only half of which is useful. Fire magic will be your staple, as it allows you to kill anything at a distance and costs next to nothing. Return is essential for logistical reasons, and Telepathy allows you to communicate with demons, and also avoid combat. In fact, you'll be spending almost as much time as a demon as you do human, which in its own way, grows rather tiresome. After all, much of your thrill comes from just running around a place acting like God. At least, when it doesn't draw attention to how easy it is. I will be fair, though, and say that despite all these flaws, I still nevertheless found myself enjoying it. The music, while certainly not as good as its predecessor, is still excellent. I still got a kick out of exploring convoluted mazes with surprisingly beautiful backdrops like the ice mountain and sewers. None of these dungeons may have provided any unique challenge like the miniscule light radius the Silver Mines in Ys I did, but I still had a good time. Ironically, what truly redeemed this game's value for me was the final boss. Because unlike the previous six confrontations, this one is brutal. I'd even rank it above the Mantis of the previous game. I spent more than two hours trying to kill this thing, and failed every time. The devil zipped around the screen, appearing then disappearing within seconds. Magic orbs flew around the arena, slamming into me and dealing enough damage to warrant close observation. My saving grace was the final magic I received – a shield charm that made me invulnerable, but sucked MP like a sponge. Once that was gone, I had nothing left. My pitiful sword thrusts merely pricked him. But best of all, I couldn't leave. One of these pics I used an elixir. Can you guess which one? Eventually I managed to beat him, but it took a very long time. It was glorious. And a close one! Yes, I know he's winning in this, but I really did beat him. Promise! It's somewhat of a shame that Falcom had to split the chapters into two separate entities like this. If they'd been able to keep them together, perhaps the second half's flaws wouldn't be so pronounced. But as it is, Ys II is a considerably weaker game saved by a spectacular finish. If you enjoyed this Ys II review, you're encouraged to discuss it with the author and with other members of the site's community. If you don't already have an HonestGamers account, you can sign up for one in a snap. Thank you for reading! One of your best reviews, WQ. It looks like your time away has not been wasted! You've come back with a fresh voice, a fresh perspective, and a less essay-feeling structure. This was conversational but serious and very enjoyable. Loved it. Thanks! I'm glad you liked it. I felt pretty good about it when I finished with it, too. I did want to make it more casual-sounding than I had been with my other reviews because I wanted to make the review as engaging as possible. And, well, even if this particular game isn't as good as the first one, I'm still a great fan of the series and wanted to do it justice. I also wanted to try something semi-experimental since I was getting tired of my previous way of writing things. I'm glad it worked. Definitely worked. I feel like I got to know you as a gamer a lot better in this review than I ever have before. None of the material contained within this site may be reproduced in any conceivable fashion without permission from the author(s) of said material. This site is not sponsored or endorsed by Nintendo, Sega, Sony, Microsoft, or any other such party. Ys II is a registered trademark of its copyright holder. This site makes no claim to Ys II, its characters, screenshots, artwork, music, or any intellectual property contained within. Opinions expressed on this site do not necessarily represent the opinion of site staff or sponsors. Staff and freelance reviews are typically written based on time spent with a retail review copy or review key for the game that is provided by its publisher.